The definition of a cult movie is something on which people can't seem to agree. Some feel that it is a movie which doesn't do well or is ignored when it is initially released, but as time goes by, it finds its audience, and this "cult" of fans support the movie, making it a hit after-the-fact. For other, a cult movie is a film which is simply weird and does not appeal to a wide audience. Therefore, a small group of "cult" fans are the only ones who appreciate it. (These two definitions often intersect, but we'll ignore that for the moment.) Here's one thing on which I think everyone can agree -- You can't create a cult movie. You can't make a movie which is weird simply for the sake of being weird and assume that someone will appreciate it. That lesson comes through loud and clear with Lost River. Lost River takes place in an unnamed, burned out, depressed city. Billy (Christina Hendricks) is trying to save her house, where she lives with her sons, Bones (Iain De Caestecker) and Franky (Landyn Stewart). Bones attempts to bet money for the family by stealing copper wiring from abandoned houses, but he risks entering the turf of Bully (Matt Smith), a local thug. While visiting the bank to ask for help on her mortgage, Billy meets Dave (Ben Mendelsohn), who offers her a job at a Grand Guignol theater. Bones meets Rat (Saoirse Ronan), a girl who lives with her grandmother (Barbara Steele), and who informs Bones that a town was flooded to create the local lake. As other houses in the area are being demolished, Billy and Bones race to save their house. I suppose that the above synopsis makes some sense, but it also probably sounds quite vague. But, I assure you that I've described the majority of what goes on in Lost River. The film is much more concerned with mood and visuals than with story. This is one of those intentionally weird movies which brings up far more questions than answers. Why is Billy determined to stay in this dying town when she has no job or seemingly any other ties to it? Why is there a Grand Guignol theater in town? What is the deal with the weird stuff which goes on downstairs in the theater? How did they get Eva Mendes to appear in this? (Yes, I do know the answer to that one.) The movie keeps chugging along, living in a world which is indifferent to detail and not caring which parts we comprehend. Lost River was written and directed by actor Ryan Gosling. If you're ever seen Gosling in interviews and got the feeling that he might be a bit weird, I think that this movie answers that question. Gosling is clearly a huge fan of David Lynch and he appears to be attempting to channel Lynch in nearly every scene. But, here's where he goes wrong. David Lynch's movies have a very organic feel to them -- the weirdness grows out of a center which is normal on the surface and gets stranger and stranger as layers are revealed. Lost River is odd from the get go and Gosling never attempts to develop the characters or expand the plot. Lynch doesn't mind allowing us to get to know those who inhabit his movies. This helps to make it even more effective when they get strange. Gosling's movie is simply made up of scene after scene which don't gel and do nothing to draw the viewer in. This movie has many low-points, but those which occur in the theater are probably the worst. The show will only be shocking to those who know nothing of the history of live, violent theater and Gosling slides into Herschel Gordon Lewis territory here. Again, the stuff in the basement is so deviant that is almost feels out of place. To his credit, Gosling composes some nice shots, but they don't make the movie worth watching. Perhaps he should direct something written by someone else. Lost River was originally titled "How to Catch a Monster" and some thought that it was going to be a horror movie. 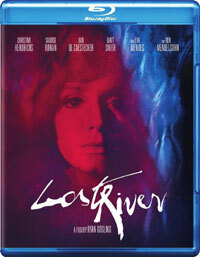 The title change seems appropriate as the flooded city certainly could be the "lost river" and there are no monsters in the film, save for metaphorical ones. Actually, having read a (misleading) synopsis of the film, I kept waiting for the flooded town and Bones exploration of it to actually yield something meaningful, but like nearly everything else in this movie, it was a dead-end. I can't help but wonder if Gosling is trying to be like Jared Leto, a pretty-boy in search of respect. Well, making a non-sense movie is not the way to achieve it. Lost River does not get the street cred which it wants by casting Barbara Steele on Blu-ray Disc courtesy of Warner Home Video. The film has been letterboxed at 2.35:1 and the Disc contains an AVC 1080p HD transfer which runs at an average of 21 Mbps. The image is sharp and clear, showing no overt grain and no defects from the source materials. This is a dark movie and some scenes border on being too dark. However, the movie also features some bright colors, such as pinks and purples, and they look fine. The depth is notably good and the level of detail is impressive. The Disc carries a DTS-HD Master Audio 5.1 track which runs at 48 kHz and an average of 3.6 Mbps. The track provides clear dialogue and sound effects. The stereo effects are nicely done, as they show great separation. The surround sound effects show off the detailed mix and envelope us in sound. The subwoofer effects arrive during the demolition and the finale. There are no extra features on the Lost River Blu-ray Disc.